I was given a bag of these plastic ball-pit balls recently and decided to combine them with a bunch of plastic containers from our local op-shop for 10 cents each. 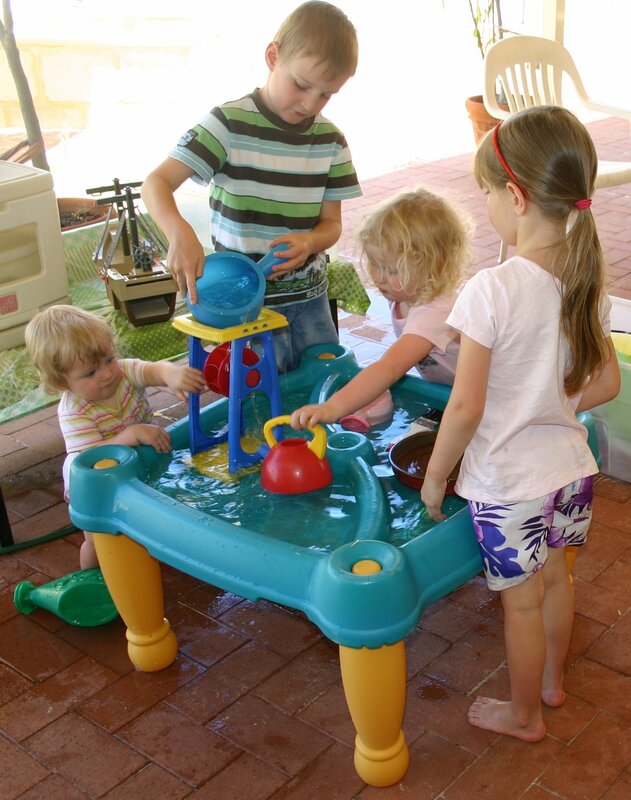 A little water in the water trolley and the kids were all set for some creative outdoor play. Even though it is getting cold here, water play on occasion still goes down well, we just have to follow it up with a nice hot shower for all. As you can see, the children immediately began sorting the balls by colour, filling the jugs with “juice” and baking all sorts of wonderful creations. And the sound-track to this happy experience? Lots of bickering and arguing about who had what first and how it all should be arranged and other petty disagreements. We all have those days….. The warm weather continues, which in some ways is wonderful and others not so much! Instead of enjoying outdoor time, my children start pressing themselves up against the glass sliding door and asking to come inside where it’s cool. Time to bring out the water play. We bought this water table secondhand for $5 last year and it definitely was a bargain. All the children, even the toddlers, enjoy standing around it and getting thoroughly soaked as they play with the sand toys in the water. 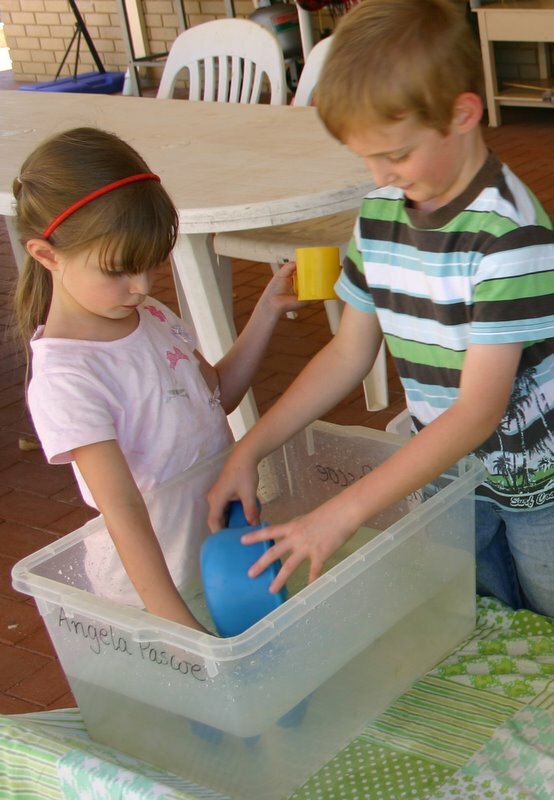 I like to use outdoor time to get some of my own responsibilities completed, so all water play needs to be set up so that it is safe – no deep containers for children to fall into. The swimming pool and slide etc. does not come out at these times – that needs high level supervision. I do keep an eye on the children but, as I am not right next to them, water levels are kept to a minimum. The water table is ideal as it is up high and only holds a few inches of water. Before we owned it though, water play was just as enjoyable. We used the lid of a clam shell sandpit and filled it to a shallow depth (about an inch) and the littlies could sit in it and play – double the wet fun. The older children prefered containers like buckets and tubs filled to a deeper level so I put these up on benches away from the little ones. While I do not expect the older children to take on the responsibility of supervising their brothers and sisters around water, the fact that they are playing there means there are several pairs of eyes on the situation, including mine. I know I will be called very quickly if a toddler starts trying to get into the deeper tubs – particularly as it interrupts the older children’s games! 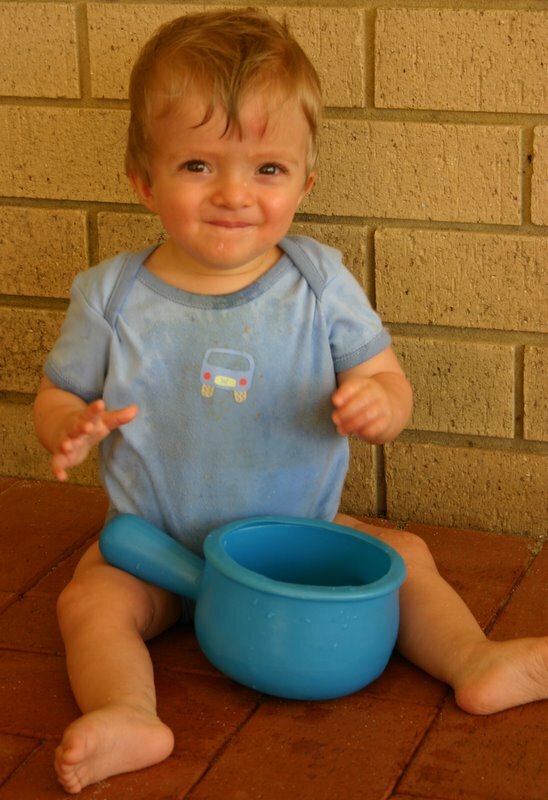 Babies and toddlers are happy with just a couple of containers of water to splash about in but as the main game seems to revolve around tipping the water out again, you or an older child needs to be available to constantly refill their containers. The bigger children don’t mind scooping a saucepan of water out of their tub over and over again as they have the freedom to access the hose and refill it to the agreed level as required. If you can stand the sandy mess, add the water play to the sandpit and you won’t hear a single complaint for hours! Nothing much is better for young children to keep busy in than water and sand. When it’s time to come in, I just stand them in a line and hose them all down before sending them in for proper showers and baths.